While we all remember the hundreds of thousands who made the greatest sacrifice in defense of our freedom over the past two and a half centuries, Team Lowe’s will be paying tribute to one young man in particular. Specialist Michael Rodriguez was born on May 30, 1986 in Syracuse, New York. Over the next decade he would move multiple times, just as countless military families do, as his father was transferred from base to base. The family ultimately ended up in Knoxville, Tennessee - the place Michael came to love and call his home. Upon graduating from High School, Michael followed in the footsteps of three generations before him and enlisted in 2005. He was assigned to the 5th Squadron, 73rd Cavalry Regiment, 3rd Brigade Combat Team, 82nd Airborne Division, out of Fort Bragg, North Carolina. As a AA paratrooper and Calvary Scout, he proudly wore the Cavalry Stetson and spurs. In January of 2007, in what was to be his final visit to his beloved town of Knoxville, Michael proposed to his fiancee, Caitlin Stone. On April 23, 2007 while serving in Sadah, Iraq, fourth generation solider Spc. 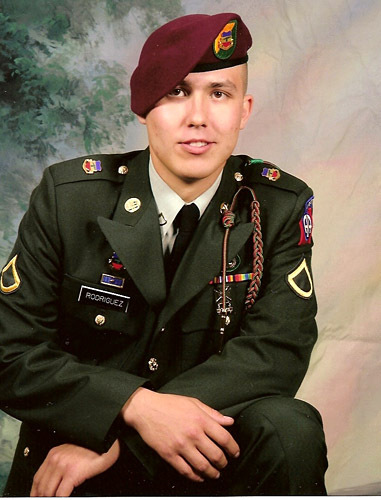 Michael Rodriguez and eight of his paratrooper brothers were killed by an IED in a suicide truck bombing on their position. He was 20 years old. 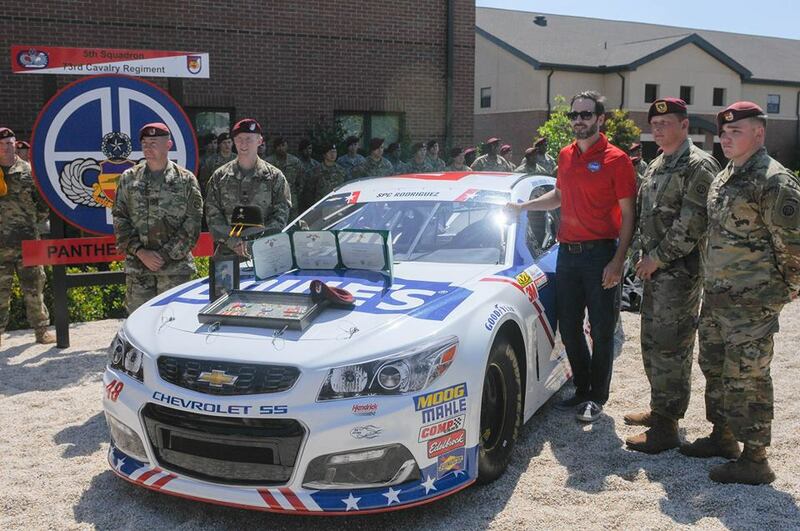 Recently, Jimmie Johnson and Team Lowe’s visited Fort Bragg to unveil this year’s red, white, and blue Coca-Cola 600 scheme and visit with the family and comrades of Spc. Rodriguez. In the time since her son’s passing, Lori has been working at the Fort Bragg chapter of The Fisher House Foundation, which is best known for a network of comfort homes where military and veterans’ families can stay at no cost while a loved one is receiving treatment. Fisher House Foundation ensures that there is never a lodging fee. Since inception, the program has saved military and veterans’ families an estimated $360 million in out of pocket costs for lodging and transportation, including 28,000 families in 2016 alone. At the unveiling, Lowe’s presented a check for $10,000 to the Fort Bragg Fisher House in honor of Spc. Michael Rodriguez, which coincides with the over 10,000 veteran employees who Lowe’s is proud to have wear the ‘Red Vest’ nationwide. You can donate to the Fisher House here. 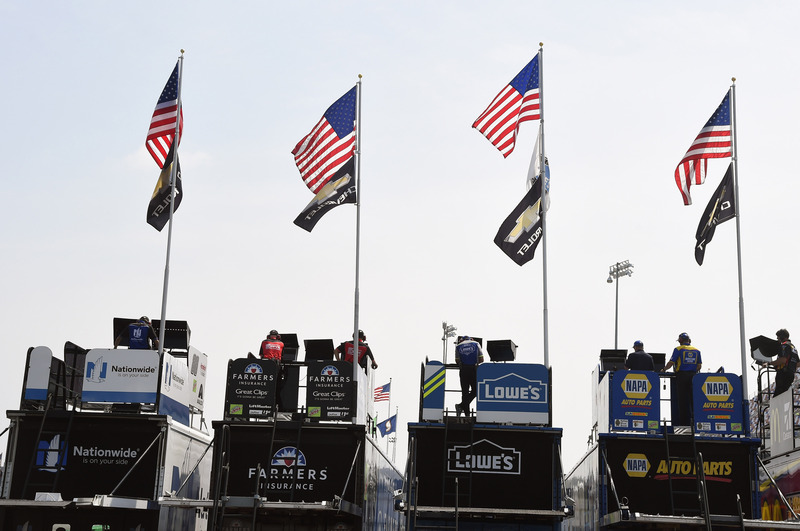 Lowe’s is also proud to give 10% off every day to to all active personnel & veterans, in-store and online. Sign up at http://lowes.com/military. So this Sunday, as we in America are priveledged to enjoy 1,100 of the greatest miles in racing, take some time to remember those who made it possible. As we remove our caps for the invocation, say a prayer with us for those who gave it all, from Bunker Hill to Fallujah. As you hear the somber notes of taps from both Indianapolis and Charlotte, think of the brave fallen soldiers from Normandy to Korea. As you hear the Star Spangled Banner, give thanks to those from Gettysburg to Vietnam. And as you watch the Lowe’s Chevy race into the night with Spc. Rodriguez riding along, remember he and his eight brothers in arms who paid the ultimate sacrifice on April 23, 2007: Spc. Jerry R. King, Sgt. Michael L. Vaughan, Sgt. Brice A. Pearson, Sgt. Randell T. Marshall, 1st Lt. Kevin J. Gaspers, Staff Sgt. Kenneth E. Locker Jr., Staff Sgt. William C. Moore and Pfc. Garrett C. Knoll. Thank you to the families of all who have served this great nation to the very end – your loved ones will never be forgotten.